Do you love expertly-roasted coffee? How about foam? What about expertly-roasted coffee + foam + art? Yes to all of this? YAY! Good deal. Because this is going on Feb 28th. Anyone with any skill level can enter. Be there at 7 p.m. to own this thing by signing up and slapping down $5 on the bar. 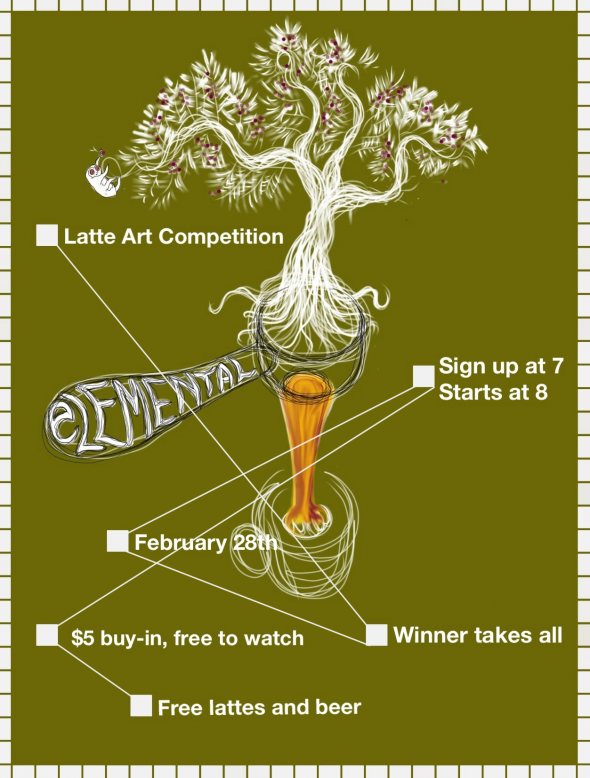 The rest of you who are coming to enjoy, stroll in around 8 p.m. Elemental Coffee has a fairly an open space/floor plan, but seating at the bar is limited. Get there early if you want to get a good view. Obviously it helps if you’ve had experience. But I’m throwing this in for all the destitute students out there (who may or may not have worked at Starbucks at some point): Do you need a jolt of free quality caffiene so you can finish that paper due on Friday or whatever – you should really consider going. Just sayin’. Even better if you have $5 and a working knowledge of espresso and foam. Could win the jackpot on this one. Because I want you to win! Tagged ART ✍, Au Revoir Simone, beer, Elemental Coffee, Friday, North Hudson, OKC, OKC 365, Oklahoma City, space, video. Bookmark the permalink.